There's a new court at Otterbein Lebanon and it is for a game called bocce ball. This ancient game, whose modern adaptation most closely resembles bowling, requires skill, strategy and just a little luck. 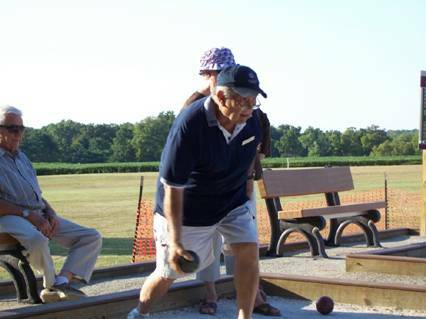 Bocce ball is a great game to play outside on a beautiful day. It is highly popular among seniors, but youths are sure to enjoy this accuracy game. There are a thousand different rules and methods that vary depending on where you live. (ex: California rules versus Italy; New England versus Florida rules, etc.). To learn more about Otterbein Senior Lifestyle Choices, please visit www.otterbein.org or call 1-888-513-9131. Otterbein Senior Lifestyle Choices, founded in 1912, is a non-profit health and human service ministry, serving nearly 3,000 people, and is related to the East Ohio and West Ohio Conferences of the United Methodist Church. Otterbein has five full-service retirement communities, five skilled nursing and rehabilitation neighborhoods and a home health agency.